Here’s an Infographic about TED Talks at TED.com – an online idea-sharing and education platform and one of the most successful and well-known. TED Talk videos have been viewed over 800 million times since 2006. With names like Bill Clinton, Sergey Brin, Steve Jobs and Jane Goodall, the roster of TED speakers reads like a who’s-who of today’s living scientists, educators and humanitarians. 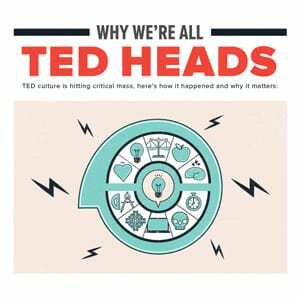 Now, six years after uploading its first video, TED.com is innovating online education yet again. A new site,TED-ed.com now provides a platform for teachers and students to share video lessons. Teachers can modify, or “flip”, the videos to make them more relevant to their own lessons and use the site’s test and project writing tools to measure comprehension. The site continues to build its video lesson library by bringing user-nominated educators and animators together to create multimedia videos on everything from the mathematical genius of Archimedes to the significance of the Higgs-Boson particle discovery.